Another day, another Tabatha out of a job after being racist and nasty online. 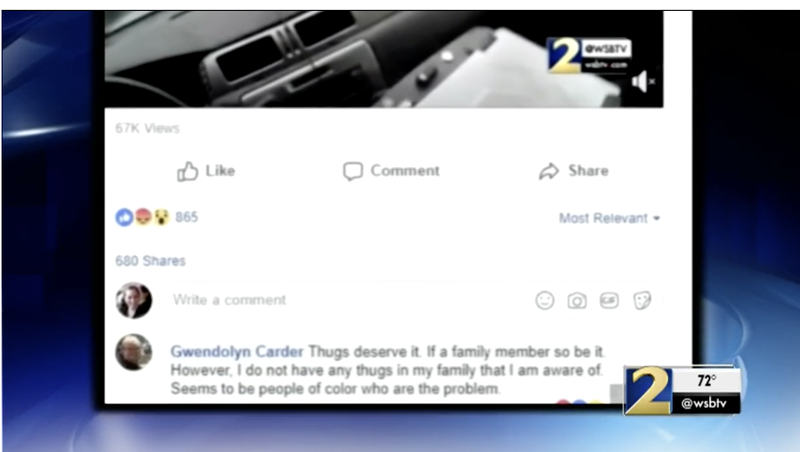 According to WSB-TV, Atlanta-based UPS human resources supervisor Gwendolyn Carder is now jobless after posting online that a black suspect was a “thug” and insinuating that the suspect deserved police violence. Carder’s post appeared in the comments section of an article about Athens-Clarke County, Ga., Police Officer Taylor Saulters, who was fired after footage surfaced of him ramming his patrol car into a fleeing black suspect, Timmy Patmon, who was trying to escape on foot. Saulters’ unemployment, however, was short-lived because he was quickly hired by the sheriff’s office in a nearby town. “Thugs deserve it. If a family member so be it. However, I do not have any thugs in my family that I am aware of. Seems to be people of color who are the problem,” Carder wrote under WSB-TV’s post about the story. UPS was not about Carder’s shenanigans, and as soon as it was confirmed that Carder was indeed an employee, she was unceremoniously sacked after 25 years on the job. “UPS has no tolerance for hate, bigotry or prejudice. The company embraces diversity and inclusion as one of its core values. The comments Ms. Carder shared in response to WSB-TV’s story do not reflect UPS’ values or culture,” a UPS spokesperson told the station. “That was pretty bold, and now she has to deal with the consequences of it,” Washington added.